17 Six days later, Jesus took with him Peter and James and his brother John and led them up a high mountain, by themselves. 2 And he was transfigured before them, and his face shone like the sun, and his clothes became dazzling white. 3 Suddenly there appeared to them Moses and Elijah, talking with him. 4 Then Peter said to Jesus, “Lord, it is good for us to be here; if you wish, I will make three dwellings here, one for you, one for Moses, and one for Elijah.” 5 While he was still speaking, suddenly a bright cloud overshadowed them, and from the cloud a voice said, “This is my Son, the Beloved; with him I am well pleased; listen to him!” 6 When the disciples heard this, they fell to the ground and were overcome by fear. 7 But Jesus came and touched them, saying, “Get up and do not be afraid.” 8 And when they looked up, they saw no one except Jesus himself alone. “Faith is the assurance of things hoped for, the conviction of things not seen” (Hebrews 11:1). Faith is something that depends not on empirical proof, but testimony. According to Hebrews the ancients lived by faith, trusting a vision that God laid before them, even though they didn’t have all the details in place. Living as we do in a scientific age, when the old ideas about God’s activity are pushed further back into the dust bin of history, we who are followers of Jesus walk by faith and not by sight. 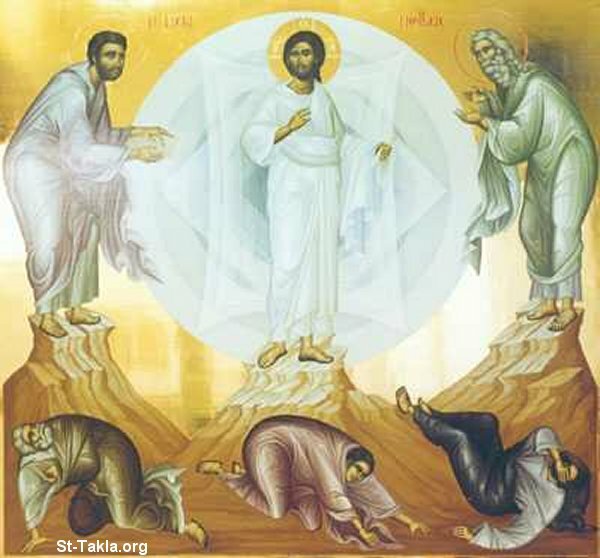 If we are to hear the message of the story of Jesus’ Transfiguration, then we must take a leap of faith. The Transfiguration of Jesus is a moment of testimony that reveals the deeper story of God’s presence in the world. We ask – who is this Jesus? What is his connection to God? The disciples have been in the presence of Jesus. They know there’s something different about him, but they’re still in the dark. A chapter earlier, Jesus asks the disciples who they believe he is. Peter responds by making the Good Confession: “You are the Christ, the son of the living God” (Matthew 16:15-16). Many of us have made the same confession, only to follow Peter in demonstrating our own lack of understanding of our confession. The question that face as the season of Epiphany comes to a close is this: Who is Jesus – today? The battle lines drawn up between those who emphasize the Jesus of history and the Christ of faith, those who want to emphasize humanity and those who emphasize divinity, may miss the point if they can’t let go of these battles and recognize, with Paul, that we currently only “see in a mirror dimly.” In moments like this, when we are able to break through the membrane separates us from the divine, we’re put in a place of seeing “face to face” (1 Corinthians 13:12). As we dive deeper into this story, allowing it to embrace us and reveals to us the person of Jesus, we need to ask the question – why are Moses and Elijah present? What role do they play? Besides being figures of the past they represent the witness of Scripture – the Law and the Prophets. As I consider this encounter, I’m reminded of Karl Barth’s idea of the three-fold Word of God. Scripture as Word bears witness or points to the Word that reveals God most fully – Jesus, the Christ. The voice from heaven needs to be heeded. “This is my son the beloved . . . listen to him.” Hearing this witness from above, which hopefully opens our eyes to the one who reveals to us the person of God, what is it that he is saying to us? In the weeks prior to this, we have considered a portion of Jesus’ Sermon on the Mount. Is this the word that God is calling us to embrace? There are, of course, other words and there are his deeds – what do they say to us? In order to hear these words and respond to them in a way that will transform (even transfigure) us, we need to let this story take hold of our lives by faith. Looking back at the life of Jesus, his later disciples began to see more clearly who he was and is and will be. Jesus asked the disciples – who do you say that I am? Are we ready to answer with Peter – “you are the Christ, the Son of the Living God?” And if we are, what is the nature of our understanding? Is it sufficient to enable God to transform us so that we can take a journey that brings glory to God and blessings to God’s creation? Is it sufficient so that we go forth not in a triumphalist mode, but one full of grace and humility? Indeed, are we ready to head this voice calling us to follow him to the ends of the earth with a message of divine love?